Split reminded me why I love M. Night Shyamalan so much. 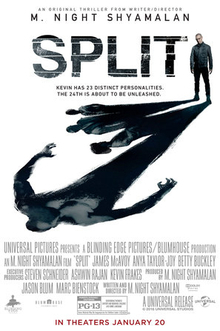 He hasn’t been at the top of his game lately, with films like The Last Airbender and After Earth not bringing him much success, but Split is easily his greatest film since Signs, which was released almost fifteen years ago. Shyamalan brings back what made The Sixth Sense, Unbreakable, and Signs so great and uses it to develop a fantastic psychological thriller. James McAvoy gives the leading role of this film everything he’s got, and I never imagined that he was capable of delivering such an insane and incredible performance as the kidnapper with multiple personality disorder. He portrays every personality so uniquely and I could tell he was so committed to making this character as unforgettable as he turned out to be. Anya Taylor-Joy delivers another superb leading performance, bringing so much depth, fear, and emotion into her character. The interaction between the main characters is always interesting and significant. The first act starts out a little bumpy in terms of its writing, but soon the stakes are raised and it all leads up to a thrilling final act. Every move them film makes feels so mysterious and threatening that it could be hinting at anything. Everything feels very subtle, which is why there’s so much suspense. Shyamalan’s writing and directing here makes Split more special than it looks, and I felt like I was watching something much different than most films we go see on the big screen. He should have kept making movies like this years ago. I am glad to say that Split is M. Night Shyamalan’s return to form, with so much suspense that it’s unqiue and unpredictable. The performances are outstanding, and the ending is one of Shyamalan’s most brilliant decisions. Split is an absolute treat to watch, especially for fans of Shyamalan’s golden days, like myself.